Stop100.ca announces its Facebook page has just crossed a milestone of 10,000 Likes. The group also offers an "email sign-up" opportunity for those who do not use Facebook and there are over 7,000 people who have joined Stop100.ca this way. Currently, there are over 17,000 combined supporters of Stop100.ca. 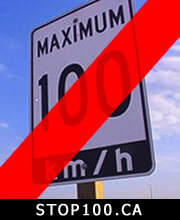 Stop100.ca Founder Chris Klimek said, "I am very excited about this development - it shows that people are very tired of our inappropriately low freeway speed limit and they finally want to drive with peace and no fear of the Police". "Our next goal is to exceed 16,000 Facebook members - this is how many supporters have joined Premier Wynne's Facebook page. We want to show the authorities that we are for real and significant numbers of voters do not believe the propaganda that our speed limit is saving our lives. On the contrary, our speed limit disrupts traffic flow, makes driving at widely accepted highway speeds illegal, wrecks motorists' driving records and raises insurance premiums. It's time for this to stop," said Klimek. The group will continue to grow until the authorities can no longer ignore their demands. Klimek said the group will not rest until Ontario sees 120 and 130 km/h speed limit signs, similar to those found in most countries around the world. "Many jurisdictions are proving that such limits are safe. Additionally, speed limit compliance rises. There is significant evidence to prove that," said Klimek. The group's rapid growth is confirmed by several very favourable polls which show 70-80% of Ontario population in support of realistic and appropriate freeway speed limits.